It would be great if you could implement these wishes. 1. When editing a game, for example, in the game view or in the Arcade view, you can delete it from there. 2. If you want to install games that you can choose before installing the category where to install them. That saves a lot of work. 3. In the game view you see the controls how to play the game. Whether with the mouse or the keyboard. 4. That you see in the game view the description of the game. 5. If a user reports a game defect, he can enter a reason what exactly is not the game. Saves the admin a lot of work so he knows what's wrong. And that in a game report a thread rises in the forum. Then the users can track it. Is it possible to exclude individual games from the download? If not, could you please implement that. Could you please have the game description displayed in the game view during the next update? My users miss that. For many games it is very important to be able to read the description of the game. 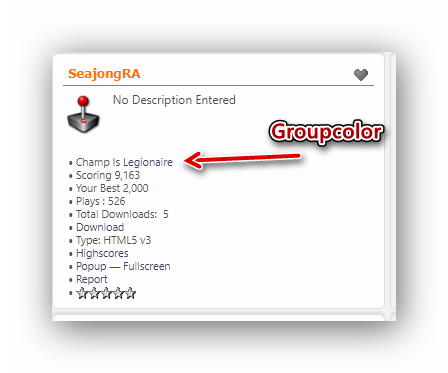 Could you please show the names in the arcade in groupcolor as well.